A couple of weeks ago, while the Sheppy family was vacationing in South Dakota, I got an email from the Contact Me form on this blog. It was from someone at summernanny.com telling me about an article they had just posted called 6 Tips for Having a Great Camping Trip With Your Family. "Please free to feature or mentioning it in your blog"
I'm easy that way ... if you email me asking me to share something, I probably will. Of course, I can't promise it will do you any good, but I'll do it. For sure. One reason that I have taken so long to share this article (my apologies to the author who sent along the link) is that I thought I would like to piggyback on the article. I have been doing quite a bit of family summertime activities over the past few weeks, which takes time away from blogging. And of course there is the fact that I've been lazy. Of course, if you are one of my regular readers, you know that we go family camping quite a bit. 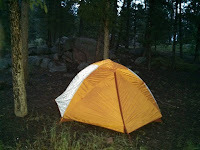 In fact, when I got the email, we had just camped for 4 days in Custer State Park in South Dakota. And, in fact, the family and I just got done backpacking this past weekend in the Lost Creek Wilderness. I do plan to share pictures from both those adventures sometime, but with the laziness I mentioned before, who knows when that will be. But, just having returned from backpacking in the Colorado Wilderness with the kids, I thought I would add a couple more tips from the perspective of backpacking. This really falls under the "Don’t Overdo It" tip from summernanny. If you think you can fit one more thing into an 8-year-old's pack, DON'T. In fact, you should probably take out a few more things. If your choice is to weigh yourself down or your kid, take it yourself EVERY time. Trust me, if the experience is difficult and miserable for your child, it will be miserable for you. I have a similar policy in regards to my wife and backpacking. In my opinion, a camelback bladder is a must! You have to keep your kids (and yourself for that matter) well hydrated. Not getting enough water is not pleasant. Of course, you need to balance the water the kid carries with #1 on my list. Water is heavy. So, plan your trip along a stream or some other water source and bring a water filter or some other way to ensure safe drinking water. Fill up as often as you need to. Don't Get Frustrated with a Slow Pace. Again, see summernanny's "Don’t Overdo It". Let your kids take lots of rests and enjoy the scenery. Whatever you do, don't show frustration about these big rests. (this is something I need to work on). If you do a good job of "Plan Ahead", it will help. Pick a spot you know that will not take you long to get to so that you are not in a hurry and can enjoy a leisurely pace. The hike is supposed to be fun, not too much work. Plan on having to wait out rainstorms in the tent. You'll need something to entertain the kids. Bring books and / or games and / or something. Mad Libs are a great hit for us. We also make sure we have an easy family card game like UNO. I remember playing lots of Crazy Eights when I was a kid. I think all kids want to feel useful. I think it is extremely important to let the kids do some of the campsite work. Sometimes it is faster to do something yourself, but if it is something the kids can help with, let them (make them). Get them to help set up and take down the tent. My youngest loves to search for firewood and build the campfire structure. Get them to fetch water from the stream. I don't think it is important what jobs they do. But, they have to help out. The most important thing is to have fun. Hiking with everything you need to survive for a couple of days is hard. Make sure you emphasize the fun part of being in the wilderness. Let the kids explore and play. Explore and play with them. Most of my favorite child-hood memories involve camping, and I really want my kids to have the same sort of pleasant memories. I'm sure I could come up with tons more family backpacking tips, but these are the most important ones I can think of. Of course, all the summernanny tips work for backpacking as well as car-camping. "I have a similar policy in regards to my wife and backpacking." Thanks for leaving a comment, Ella. I can't imagine I would ever buy a tent from the UK, but I guess you never know. Good tip, Chase. It is also important to review what is in your first-aid-kit regularly. I love this post, really enjoy when people understand how important outdoor family time is. I totally agree with you that it teaches children hard work equals good results. Lovely post.